UPDATE: New features unveiled during the presentation and Q&A session are described below. Here at Samsung's SSD Global Summit in South Korea, the company has just officially unveiled their next generation of M.2 PCIe SSDs. The new 960 PRO SSD is the successor to the 950 PRO, launched at last year's Summit as Samsung's first M.2 PCIe SSD for the retail market. The new 960 EVO introduces a more affordable option based on TLC NAND flash. Samsung's early M.2 PCIe SSDs were officially OEM-only products. The XP941 was one of the first PCIe SSDs designed for client computing use and used the AHCI protocol that is standard for SATA controllers rather than the newer NVMe protocol. The next generation consisted of the SM951 and PM951 SSDs, which adopted a new controller that supports PCIe 3.0 x4 operation and provides NVMe support as an option. 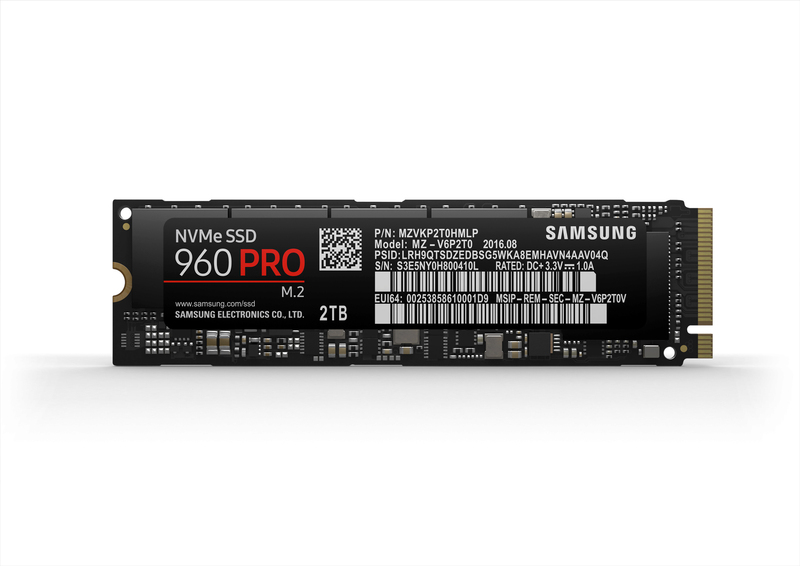 The 950 PRO uses the same controller as the SM951 but introduced Samsung's 3D V-NAND to the product family for the first time. Earlier this year, Samsung released a new generation of OEM M.2 PCIe SSDs: the SM961 and PM961. These brought V-NAND to the OEM side of the family and introduced a new Samsung "Polaris" SSD controller that allowed for substantial performance improvements. Availability of the SM961 and PM961 through unofficial retail distributors has been extremely limited, but given their performance, demand has been high. The 960 PRO and 960 EVO are Samsung's answer. The 960 PRO is clearly more than just a retail branded edition of the SM961. The largest capacity will be 2TB, compared to 1TB for the SM961 and 512GB for the 950 PRO, and the smallest capacity will be 512GB. The 950 PRO never bothered with a 128GB capacity, and with the addition of the 960 EVO to the lineup, Samsung is most likely retiring the 256GB capacity due to performance limitations. Sequential transfer speeds are significantly higher while random access speeds are slightly lower. Additionally, the 960 PRO shows a power rating of 1.0A at 3.3V, compared to 2.4-2.7A for Samsung's previous M.2 PCIe SSDs. Such a big decrease in maximum power draw is sure to translate to significant savings even in ordinary usage. (Update: this label is probably incorrect, as the presentation cited 5.1W active power for the 512GB 960 PRO, a more modest power saving.) Unfortunately, the warranty is still the 5 years offered on the 950 PRO rather than the 10 years offered for the 850 PRO. As with the 960 PRO, the 960 EVO differs from its OEM counterpart. 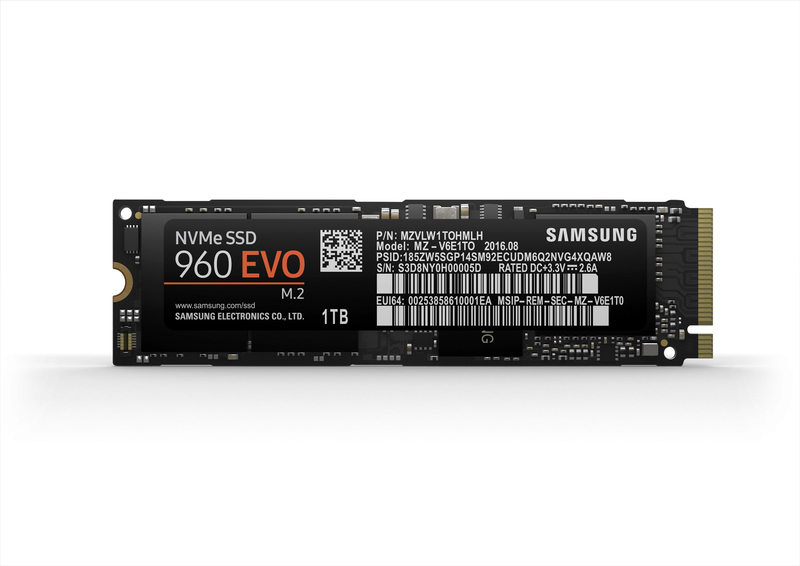 The capacities are the slightly lower 250GB-1000GB typical of Samsung's EVO SSDs rather than the power of two capacity points used on the PRO and OEM products. Peak sequential write speed is substantially higher than the PM961 and even exceeds the 950 PRO, thanks in part to Samsung's new generation SLC caching technology branded "Intelligent TurboWrite". The rest of the performance specifications are slightly higher than the PM961. There's no 2TB option, but this is purely a business decision rather than a technical limitation. Samsung has had a bit of a rough year with the transition to their 48-layer V-NAND: the promised 1TB 950 PRO never materialized and other products using the 48-layer V-NAND have been late or also failed to show up. Fortunately, Samsung's SSD controller technology hasn't faltered and their competitors have been slow to catch up. With the launch of the 960 PRO and 960 EVO, Samsung is putting most of those troubles behind them and they will probably resume dominating the SSD market while making it look easy. Samsung's Polaris SSD controller is a five-core chip, compared to the three-core design of the UBX controller used by the 950 PRO. One of the 5 cores on the Polaris controller is dedicated for host communication, while the remaining four cores are used for flash management. For the 2TB 960 PRO, the DRAM is stacked on top of the controller in a Package-On-Package configuration to free up PCB space for a total of four NAND packages. Samsung has taken several measures to reduce the incidence of thermal throttling with the 960s, resulting in the 960 PRO lasting 50% longer before throttling on a sequential read test (and due to the increased performance, it transfers more than twice the data before throttling). Most of the improvement comes from increased power efficiency, but in addition, the 960 PRO and EVO include a heatspreader of sorts on the back side. The adhesive label includes a thin layer of copper. 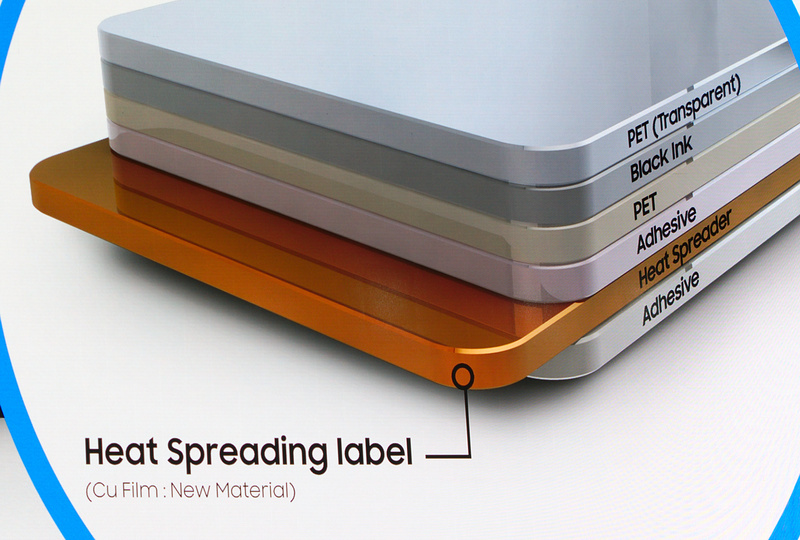 One Samsung engineer estimated that this sticker accounts for about 30% of the improved thermal performance. Samsung also previewed the next version of their Magician software, which is getting a user interface overhaul and a few new features. One of the more interesting features is a secure file erase capability. Using a proprietary extension to the NVMe command set, the Magician software will be able to issue what is essentially a mandatory block erase command (whereas TRIM is a hint the drive is free to ignore or delay acting upon). Samsung was unclear on the exact mechanism for eradicating the specified data; we're not sure if it is simply erasing the data or actually overwriting it while bypassing the wear leveling mechanism, and it is unclear what happens to any lingering data in the SSD's spare area that is from previous versions of the file. In the long run, this kind of capability will be very well received in certain government and corporate environments where it will be very handy to be able to eradicate sensitive data without wiping the whole drive, but for now this is more of a novelty feature that is being tested in the consumer market before it can acquire the necessary certifications. What is new or untested?